Guildford, the county town of Surrey, is a small market town in Southern England, halfway between London and Portsmouth. 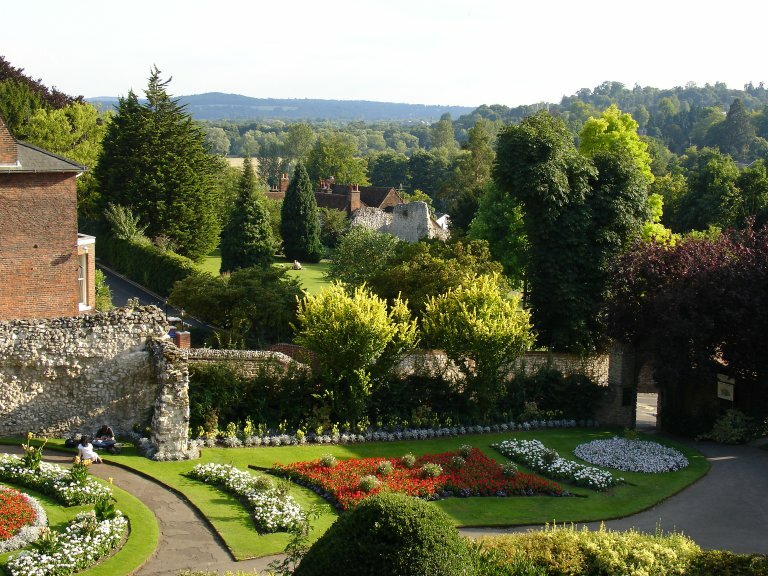 Surrey, unlike many other English counties, can not be traced back to an ancient kingdom. Surrey, was first mentioned in the Anglo-Saxon Chronicle as Suthrige, the Southern District of Middlesex, the land of the Middle Saxons. 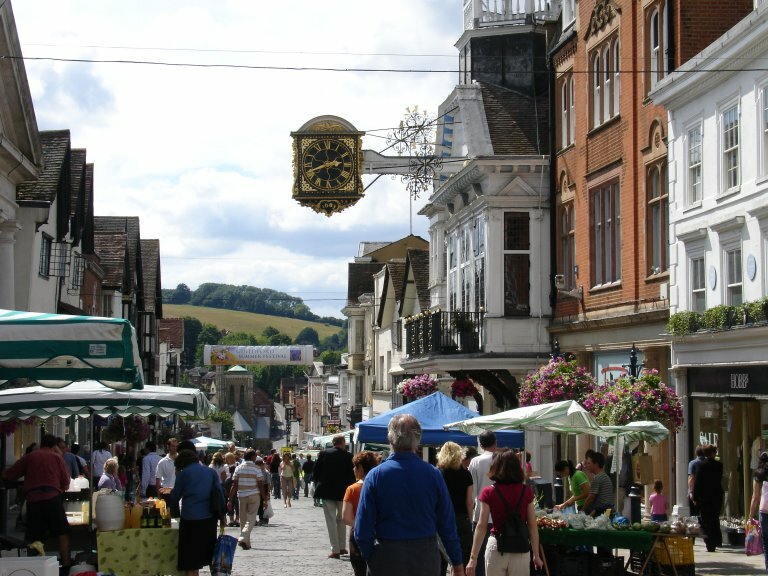 Guildford, the town of the ford, is located in a gap in the North Downs where the River Wey breaks through the hills. An ancient trackway followed the North Downs and descended to a ford a little to the south of the town centre. This route was in use as late as the 18th century. The trackway can still be found, deeply cut into the hillside. At the place of crossing a small chalk spring flows into the River Wey. The Saxons established a site on the east of the river, which later grew into a larger site on the west bank of the river around the site of St Mary's Church. Guildford was left in the will of King Alfred to his nephew Ethelwold. Ethelwold later revolted against Alfred's successor and as a result lost his property. On the death of King Canute there was confusion as to the succession. Alfred Atheling (brother-in-law of Edward the Confessor, son of Ethelred the Unready), then living in Normandy, sailed to England with a large body of men to claim the throne. He was captured at Guildford, possibly as a result of betrayal by Earl Godwin, and had his eyes put out. He died in great misery at a monastery in Ely. His followers were massacred, the remains of whom are thought to be buried in a Saxon cemetery on the outskirts of Guildford at Guildown. By the time of the Norman Invasion (1066), Guildford was one of the most important towns in Surrey. It is said that at the time of the invasion it was possible, from the Saxon tower of St Mary, to see the smoke rising from the burning of Shalford Manor. William the Conqueror passed through Surrey on his way to London from Hastings via Kent. Much of Surrey had been in the hands of Edward the Confessor and Harold II, William handed it to his half-brother Odo, Bishop of Bayeux. The town was of sufficient importance in Anglo-Saxon times to have a mint. The Normans sited a castle (now in ruins) overlooking the River Wey. In the Middle Ages, Guildford became a prosperous wool and cloth town. The location of Guildford on the main road between London and Portsmouth, made it an important staging post, with many inns being established (few of which still survive). Prior to the rise of Portsmouth as a Naval Dockyard, Guildford was on the Medieval route from London to Winchester. A succession of Medieval market towns lay on the route - Farnham, Alton, Alresford. The arrival of the railways in 1845, further enhanced Guildford's importance. 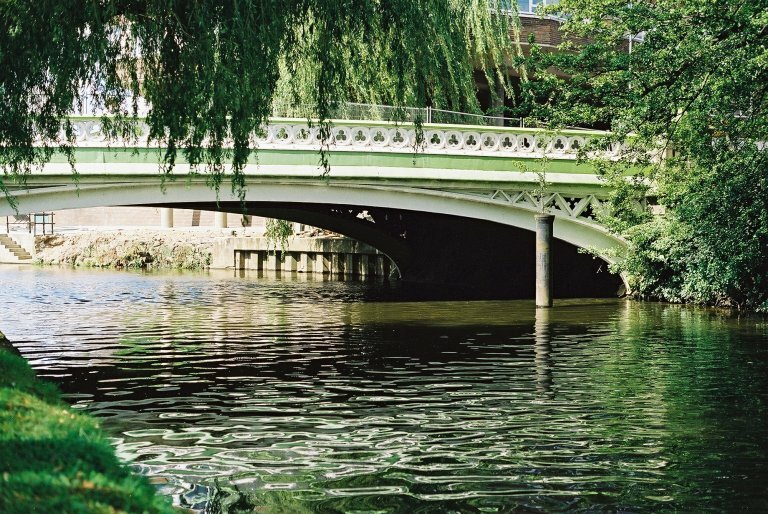 Guildford has been a borough since at least the 11th century, the county town since 1257. In 1295 Guildford returned two Members of Parliament. Henry III granted Guildford its Royal Charter in 1256. Henry III granted the charter to a body called the Approved Men, the charter alluded to their good work, indicating that some form of governing body was already in place. Edward III invited Flemish weavers which helped to establish Guildford as an important wool town, a pre-eminence it was able to maintain until the 18th century. Waverley constructed a stone bridge across the Wey, replacing the earlier ford. This remained in place until almost modern times, to be replaced by today's Town Bridge, which is now only used by pedestrians. The construction of the Wey Navigation helped to maintain Guildford's importance as a market town. 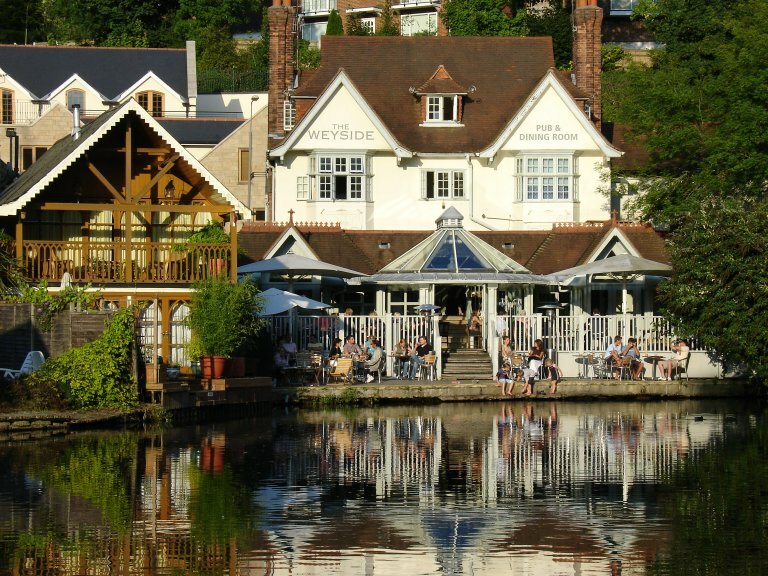 On the riverbank by the side of the Town Bridge lies the White House pub. Worth a visit mid-week when it is quieter. It serves excellent real ale and excellent food. On the other side of the bridge is the Town Wharf with a boatman casting a rope. The London & Southampton Railway received its Act of Parliament in 1834. London (Nine Elms) to Woking opened early 1838, the stretch to Basingstoke opened in 1839, the final stretch to Southampton opened in 1840. Woking Station was on Woking Heath in the middle of nowhere (Woking owes its existence to the arrival of the railway). Almost immediately a thriving trade arose ferrying passengers to and from Guildford. The branch line to Guildford opened in 1845, then continued to Godalming (1849) and Portsmouth (1859). Almost at a stroke the London-Guildford-Portsmouth coach trade was killed off, and shortly thereafter the many coaching inns (that relied upon the coach trade) met a similar fate. The White Hart at the top of the High Street had rooms of sufficient size and splendour that it was used for county balls. The inn was demolished in 1905. The cobbled High Street running up from the River Wey is relatively unspoilt and lined by a number of fine buildings. Many of the buildings present a Georgian face to the world, hiding an older core. 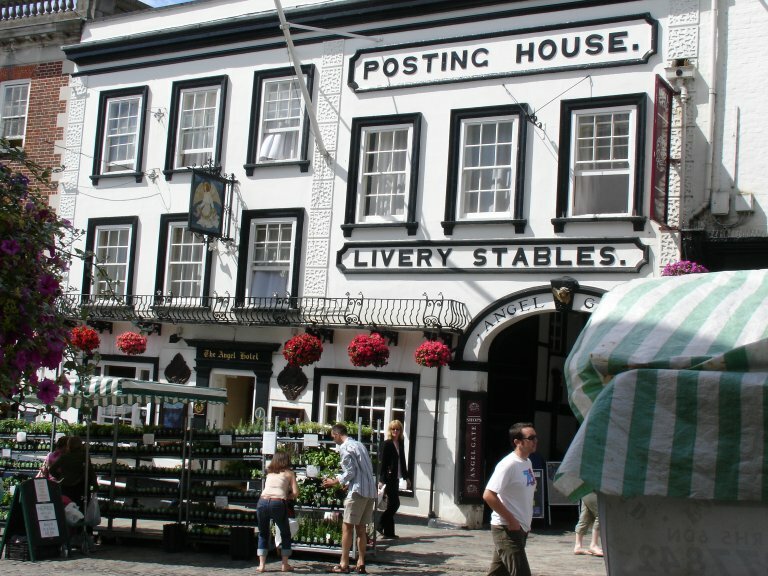 On the left, in the lower part of the High Street lies the Angel Inn, the only remaining coaching inn, with records dating back to the 16th century. Beneath the inn lies a 13th century undercroft. Rooms within the inn are named after people who have reputedly stayed at the Angel - Sir Francis Drake, Oliver Cromwell (billeting of his troops forced the inn into bankruptcy), Lord Nelson and his mistress Lady Emma Hamilton, Jane Austen. The front of the inn leads through to a courtyard. The earliest documented reference to the Angel is in a deed from Pancras Chamberleyn (1527) when Sir Christopher More bought the building for £10. Sir Christopher More's son and heir, a minister of Elisabeth I, built Loseley House. The Angel and various other properties were conveyed to Margaret Danyel by William More as part of a marriage settlement (20 July 1551). The first reference to The Angel as an inn was in 1606 when John Astret, a yeoman of Cranleigh, bequeathed it in his will to his son Thomas Astret. There were plans in 1989 to demolish the inn and convert the site to shops, fortunately public outcry blocked the developers. The Medieval undercroft beneath the Angel Inn is one of three within the High Street. One is opposite, beneath 72-74 High Street (what used to be the Tourist Information Centre). The other, a little further down the High Street, lies beneath 50-54 High Street (Dillons Bookshop). The undercroft or Medieval chamber (c 1180) beneath Dillons was discovered (1995) during excavation work for the bookshop. The chamber was only in use for about a century then blocked off. The top was chopped off leaving the bottom half. The size of the chamber is about 10 ft square. The exact purpose of the chamber is not not known, the quality of the stonework and the presence of wall paintings indicate that it was more than a mere storeroom. One possibility is a Medieval Jewish Synagogue, though this is disputed. The biggest problem is that the chamber is unique and until there is something with which to compare its exact purpose may remain unknown. The demolition work for Dillons (1997) revealed a house of correction (1611). Within Dillons are various exhibits illustrating the Medieval chamber and various finds. It is unfortunate that no-one had the imagination to install a glass floor to enable the chamber to be seen from within the bookshop. 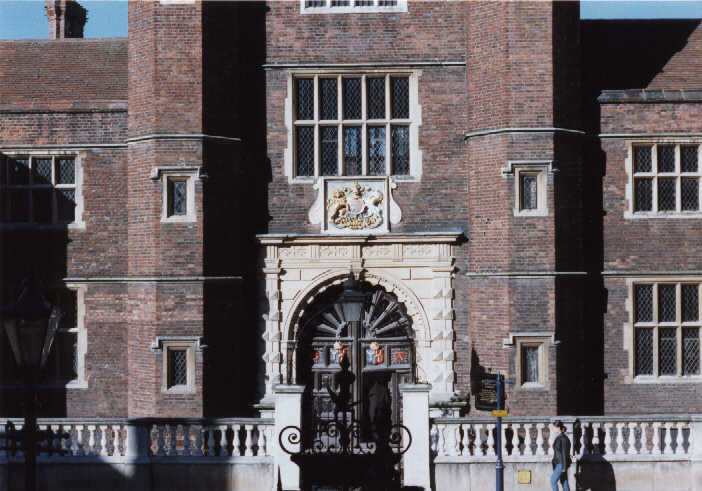 The Guildhall is a Tudor building to which a 17th century facade has been added (1683). 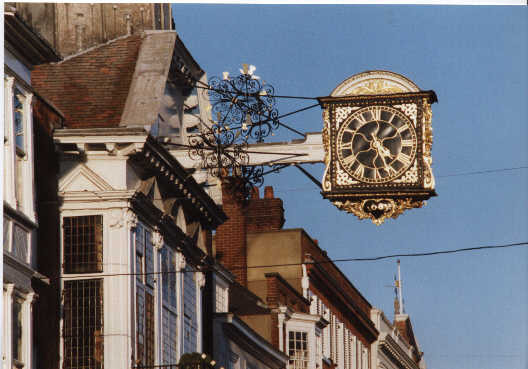 The most prominent feature is the clock overhanging the street. The date on the clock is 1683, the inner works were much older (c 1560) but over the years as parts have worn these have been replaced. The original bell, now cracked and replaced with a new bell, came from St Martha's Church (on the ridge above Chilworth). The iron balcony is used for important proclamations. Within, in the old court-room are a set of standard measures presented to the town by Elisabeth I. These measures are one of the few complete sets in existence. Opposite the Guildhall is the neoclassical frontage of Tunsgate. It was to here that the market moved from the bottom of the High Street (1818) and also the site of the Corn Exchange. Through the archway there are usually a couple of market stalls. 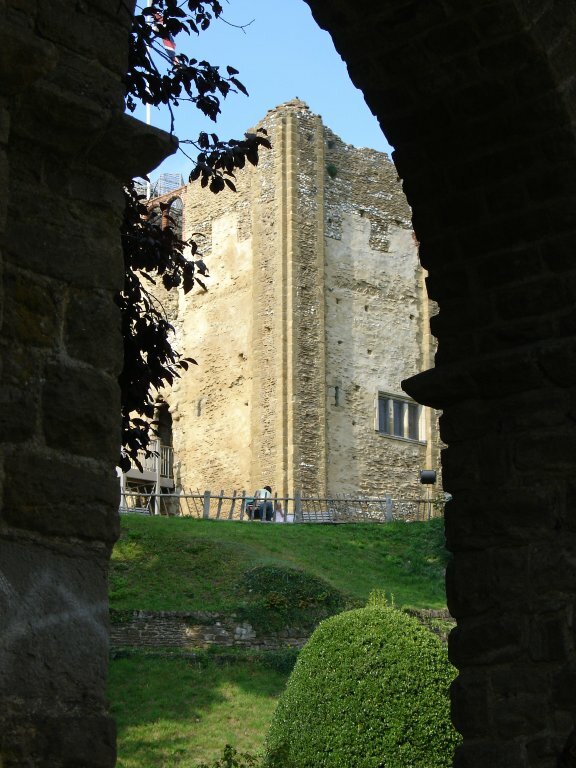 Tunsgate runs through to Castle Street, with access to the ruined Guildford Castle. Halfway along the Tourist Information Office. At the end of Tunsgate, near the corner with Castle Street, can be found Ben's Collectors Records. An excellent second-hand record shop, specialising in Jazz. Ben himself is always very helpful. John Russell RA (1745-1806) was born in Russell House, a little beyond the Town Hall. 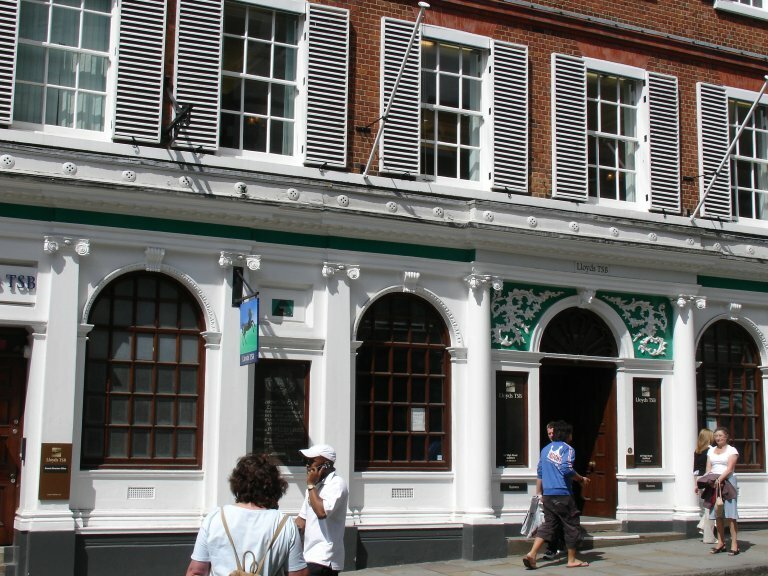 What is now the Lloyds TSB Bank was originally the Guildford Old Bank (1765). Abbot's Hospital (Hospital of the blessed Trinity), an imposing redbrick building was founded as an almshouse by George Abbot, a local man who rose to become Archbishop of Canterbury. An interesting feature are the chimneys. If the eastern route of the North Downs Way is followed through the Surrey Hills many of the villages and houses encountered en-route have equally interesting chimneys. Opposite Abbot's Hospital is the Church of Holy Trinity, within which lies the tomb of Archbishop Abbot. The tomb was established by Maurice Abbot, Lord Mayor of London, the archbishop's brother. An inscription tells how the archbishop having risen from humble origins in Guildford to the highest office in Canterbury, could go no farther on earth and then rose to heaven. Looking down the High Street there is a fine view across the river to the downs. At the top of the High Street lies Thomas Thorp's bookshop. The small shop front belies the cavernous interior. In the mid-1970s when old Mr Thorp was still actively running the shop, the inside, especially the large back part was a Dickensian delight - shelves of old books, a clerk at an antique typewriter. Now, with young Mr Thorp running the show there have been many changes - rows of brand new shelving, with shiny new books, a computer with instant access CD to quickly search all books available in print - the old books are still there, but now much reduced in number and only about half the stock. Thomas Thorp closed its doors in the spring of 2003. Outside Thomas Thorp, is a large statue to George Abbot. Archbishop Abbot was one of the translators of the Authorised Version of the Bible and founder of the Abbot's Hospital. Beyond Thomas Thorp, on the top section of the High Street lies the Royal Grammar School. Founded in 1509, granted a charter by Edward VI in 1553. 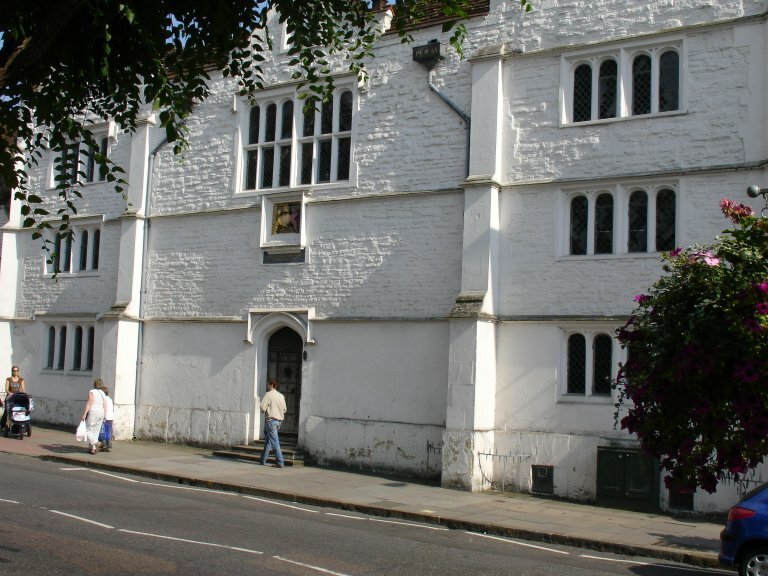 The school contains a chained library, started with books bequeathed to the school (1573) by John Parkhurst, Bishop of Norwich, a native of Guildford. The books include Sir Walter Raleigh's History of the World , written whist he was a prisoner in the Tower of London. A document (1598) referring to a match of cricket played by the boys (c 1550) is one of the earliest references to the game. Two models of the earliest cricket bats are on display within the library. All from the same family, three famous old boys of the Royal Grammar school rose from humble beginnings to high office - George Abbot Archbishop of Canterbury, Maurice Abbot Lord Mayor of London, Robert Abbot Bishop of Salisbury. All three brothers were born in a cottage in Guildford. Just past the Royal Grammar School, next door to the Oxfam Bookshop, is an excellent pub owned by Hogs Back Brewery, serving a good range of real ales. On a summer's afternoon, sit in the small garden to the rear. This excellent pub closed its doors in 2005, and is now an Italian restaurant. 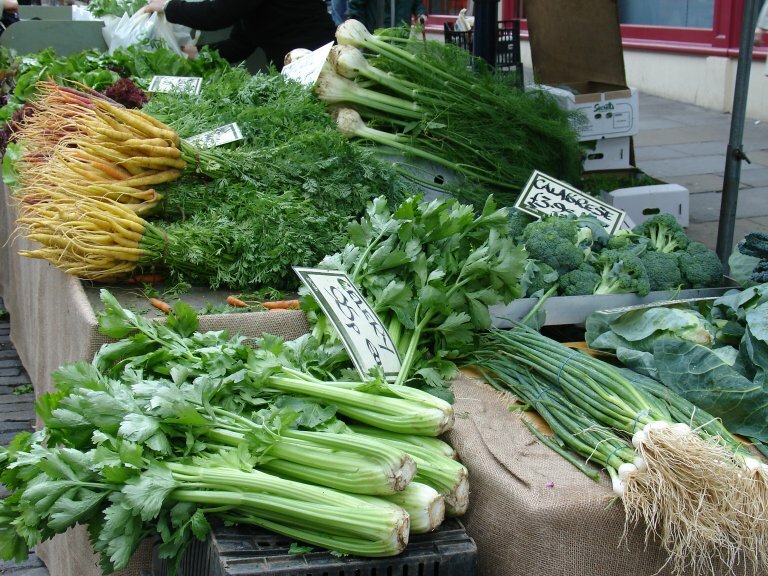 A monthly Farmers Market is held in the High Street on the first Tuesday of every month (except January). Parallel with the High Street runs North Street, unfortunately unlike the High Street it is not closed to traffic. On Friday and Saturday, market stalls line one side of the street. Most sell junk, but the fruit and vegetable stalls can be worth visiting, the one and only butcher's stall is also good. 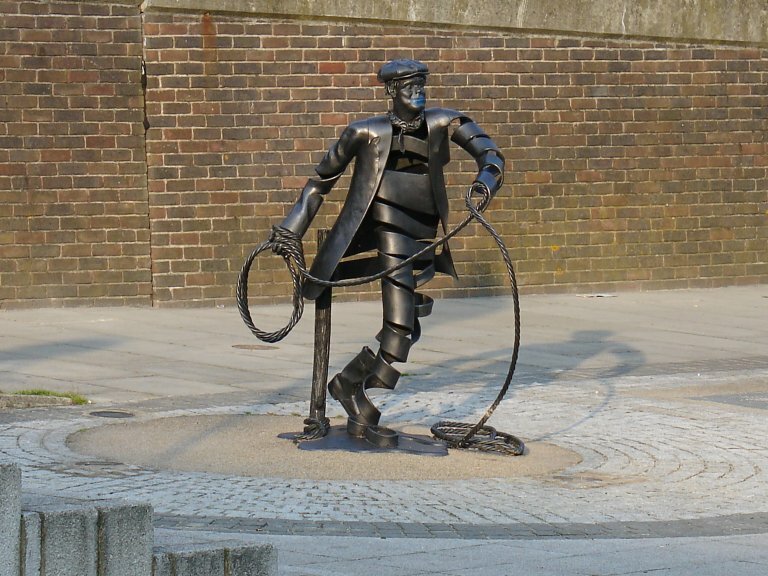 North Street was once the site of the Cattle Market (1865-90). A couple of decades ago, North Street was lined with butchers and fishmongers. 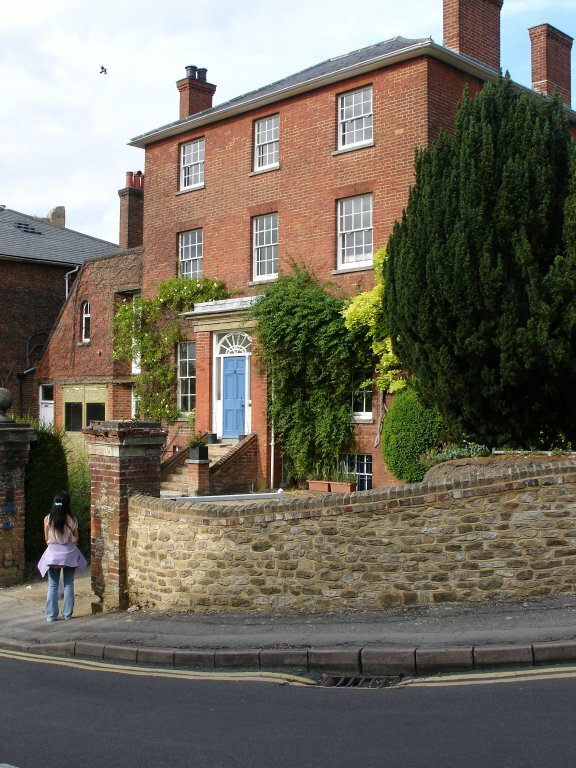 Off North Street (Ward Street) lies the Guildford Institute. Founded in 1843 it has a library dating back to the 19th century and runs a number of interesting courses. At lunch-time, term time only, excellent vegetarian lunches are served. It was unfortunate that due to falling membership the Guildford Institute lost its independence and now forms part of Surrey University. Summer 2008, Surrey University pulled the plug on the Guildford Institute and left it to sink or swim. It is now run by volunteers. On the opposite corner are public toilets, which, unusual for public toilets are a listed building. The toilets have recently (2002) been refurbished. The building was originally the Guildford Fire Station (1872). In Ward Street, past the Old Fire Station and opposite the Guildford Institute is the Friend's Meeting House (Quakers). Guildford Writers, a local writers circle, meet every alternate Tuesday evening at the Guildford Institute. To the east of the High Street lies the ruins of Guildford Castle. Only the keep and part of the walls remain. Before the keep can be seen the ruins of an earlier keep. The castle is Norman, the only one to be built in Surrey. Let into the wall of the keep are Tudor windows. From the foot of the keep is one of the best views in Guildford out along the river valley. 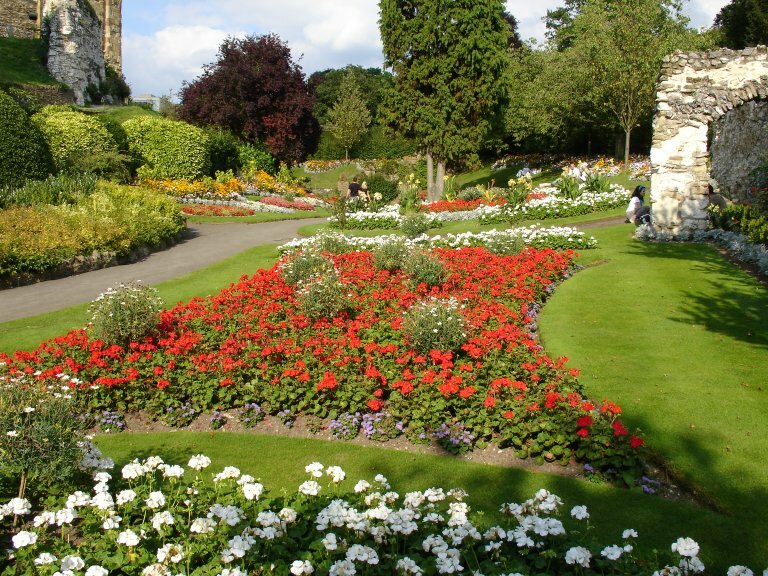 The castle grounds contain well maintained gardens, a pleasant place to rest in the middle of the afternoon. At the lower end of the High Street unspoilt Quarry Street runs past the parish church of St Mary parallel with the river. Quarry Street was the original coach route to Portsmouth. A narrow alley-way, Rosemary Alley (according to Arthur Mee previously known as Old Porridgepot Alley), runs steeply down to the Yvonne Arnaud Theatre at the riverside. Roughly halfway along Quarry Street lies the remains of the main gate into the castle. A house, now the Guildford Museum, has been built into the gate. A little before the museum is an excellent antiquarian bookshop. Through the gate and a little way up the street is The Chestnuts home of Lewis Carroll (1832-1898), author of Alice's Adventures in Wonderland and Through the Looking-Glass . The Guildford Lewis Carroll Centenary Festival took place 7-17 May 1998. P G Wodehouse (1881-1975), was born in Guildford. As a celebration of P G Wodehouse and to coincide with the National Year of Reading the Guildford Big Read was launched June 2008 by giving away free copies of his books at the Electric Theatre. Other events included Pig Racing! The idea was to get everyone reading his books before the Guildford Book Festival (16-24 October 2008). Goldenford, a small publisher, are based in Guildford. One of their authors is Surrey writer Irene Black, author of the highly aclaimed The Moon's Complexion . Irene Black has written two books: The Moon's Complexion , a mystery thriller set in South India and Sold� to the Lady with the Lime-green Laptop , amusing tales and anecdotes of her exploits on e-bay. Poet, philosopher, theologian, environmentalist Alwyn Marriage lives in Guildford. She has published five books, two on theology, three are collections of poetry. Her latest collection of poetry is entitled Touching Earth . Held over a two week period in the autumn, the Guildford Book Festival has evolved into a major literary event. Invited guests range from local poet Alwyn Marriage to internationally acclaimed author and co-founder of the Booker Prize Kate Mosse, from Mark Thomas and Tariq Ali at one end of the political spectrum to former Conservative Cabinet member and last British governor of Hong Kong Chris Patten at the other, with Misha Glenny (one of the few experts on the Balkans) somewhere in between. The 2008 festival was preceded by the launch of the Guildford Big Read, which included giving away books by local author P G Wodehouse. St Mary's Church has a Saxon tower (c 1036). The church has been much hacked about and enlarged, giving a hotchpotch of styles - Saxon tower, Norman arches and windows, through to several centuries later. An unusual feature of the church is that it is built on a slope, and the inside is on three levels. When the royal court was in session at the nearby castle the service would be held in St Mary's. Mill Lane runs down round the back of the church. This originally led down into the Mill Pool. A sketch by Alexander Monro (1883) shows Mill Lane leading down into the Mill Pool. Charles W Traylen, antiquarian and second hand bookshop, is situated halfway along Quarry Street, just before the museum. Unlike Thomas Thorp, it still has the antique typewriters, though the elderly clerks have been replaced by younger models. Much of the shop is now closed off. From the back of the shop is one of the finest views of the ruined Guildford Castle. 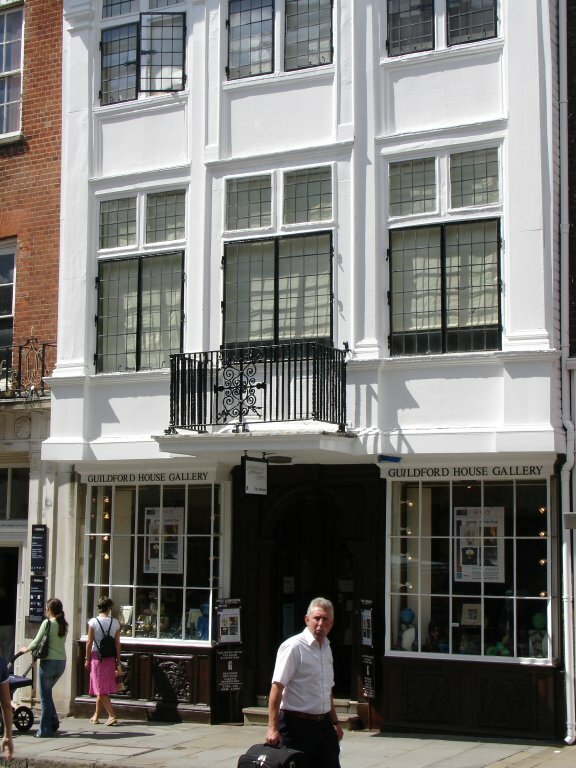 The building within which the bookshop is housed, Castle House, is Palladian (c 1740). The lower end of the High Street used to contain the town's market. The allocated areas for the various animals and other goods were laid out in 1597 - animals on Tuesdays, commodities on Saturdays. The livestock market moved to North Street (1865), then Woodbridge Road new market (1895) and finally to Slyfield Green (1970s). A photo, pre-1865, shows penned sheep occupying about half the width of the street, with a cart on the other side. At the bottom of the High Street, across the old bridge, now fortunately closed to traffic, lies St Nicolas Church. The lines at the base of St Nicolas Church indicate the height of past floods. Continuing across the road, and a steep uphill climb, leads up onto the Hog's Back, with panoramic views across the surrounding countryside. On the south side of St Nicolas is the Loseley Chapel, this is all that remains of the Medieval church. The rest of the church is 1770-5. The steep climb leading from St Nicolas up the Hog's Back, The Mount, was the original coach route to Farnham. The Mount passes by the cemetery where lies buried Lewis Carroll. A little higher up is a Saxon cemetery, thought to contain the betrayed followers of Alfred the Atheling. Descending down from the bridge leads to the river bank. A short walk along the bank leads to the Yvonne Arnaud Theatre and a lock. Nearby, in the summer months, are boats for hire. Continue upstream for a pleasant walk. A few minutes upstream, on the opposite side of the river are unspoilt water meadows. The Yvonne Arnaud Theatre is named after a famous actress (that few have ever heard of). From the outside it is one of the ugliest buildings in Guildford, an eyesore on the riverside. The inside is more attractive, though the best that can be said is that the bar gives a pleasant view out onto the river. It is one one of those theatres that play to the ladies in big hats and the Philistine middle classes, where the audience clap at the first appearance on stage of each recognisable bit-part TV character. On the billboards outside the playwright and play in small letters, the star from a TV sit-com or soap in big bold letters. Not a theatre for the literati. Close by the Yvonne Arnaud is a watermill (c 1760) with Victorian additions. About 100 yards downstream of the Yvonne Arnaud Theatre, lies the Electric Theatre, a small intimate theatre converted from a former electric power station. Of the two theatres, in terms of drama and music, the Electric Theatre is far the better of the two. The River Wey, now the Wey Navigation under the control of the National Trust, was one of the first navigable waterways in the country. Construction began in the 17th century, pre-dating the era of canal building (late 18th, early 19 Cent) by more than a century. Such was the prohibitive cost, £16,000, that many of the initial investors went bankrupt, leading to the belief that the whole scheme was a scam and and its chief proponent a crook. The Wey Navigation, from Guildford to the Thames, opened in 1651, an extension to Godalming opened in 1763. Daniel Defoe noted that the navigation was 'a mighty support to the great corn-market at Farnham'. The Wey & Arun Canal Act (1813) led to the linking of the Arun and the Wey. The Wey & Arun Canal had strategic importance beyond the immediate economic benefits it brought to Guildford. There was now an inland route between London and the South Coast, avoiding the hazardous sea route around the coast. This was of particular benefit when England was at war with the age old enemy France. The first public meeting to enlist support for the canal took place at the White Hart Inn. 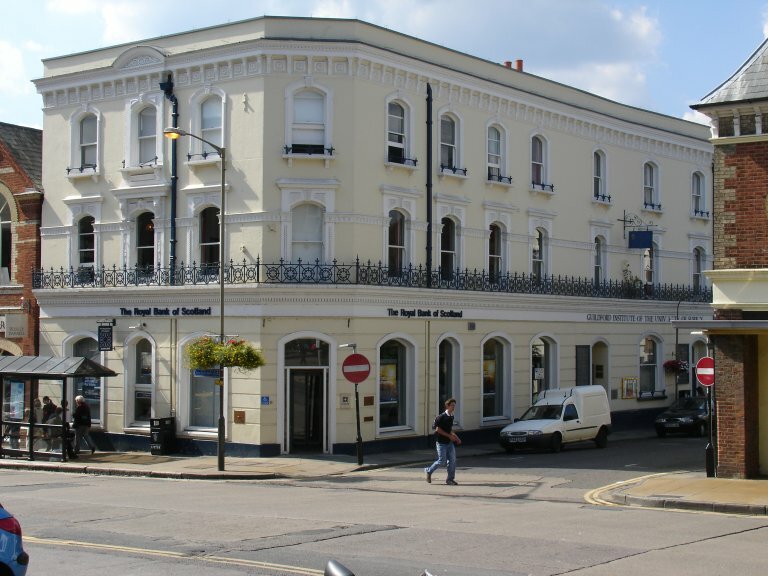 Many of the subsequent meetings including the company meetings also took place at the White Hart. There are pleasant walks along the Wey. A short way out of town, upstream, the Wey is crossed by an ancient trackway, now the crossing point for the North Downs Way. There was once a ferry at this point, now a bridge. The landing stage can still be seen on the opposite bank (the Penguin Guide to Surrey, 1956, refers to the ferry still running). A small chalk stream runs into the Wey at this point. A little way up the track alongside the chalk stream, atop a small hill, lies the ruins of St Catherine's Chapel, built before 1308. The North Downs Way runs from Farnham along the North Downs to Canterbury. It roughly follows the line of the Pilgrims' Way that ran from Winchester to Canterbury. Across the river, a short climb up the downs along the North Downs Way is the isolated Church of St Martha. From this vantage point are marvellous views of the surrounding countryside. It was here that prayers were said for Henry, son of Edward I (away in the Holy Land), who lay dying in Guildford Castle. During WW I, the church had to be disguised to look like a clump of trees as it was too prominent a landmark for German bombers. Martha may be a corruption of Martyr, early Saxon Christians are believed to have been killed on this hilltop. Below lies Chilworth Manor with ancient fish ponds and a Queen Anne walled garden. Walking south, upstream, along the River Wey leads into both the Wey South Path and the Greensand Way. Continue further upstream, passed St Catherine's Lock, to Godalming. St Catherine's Lock, opened 1764, is the shallowest lock on the Wey. The new Electric Theatre lies on the traffic island between the railway station and the town centre. The Electric Theatre is housed within the old electric power station. The adjacent old derelict buildings were once the site of one of the earliest motor manufacturing plants in the country. 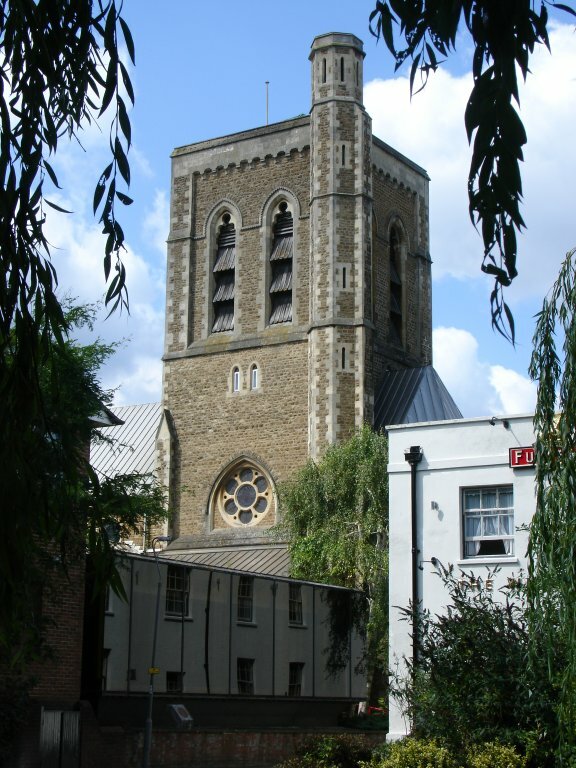 The Diocese of Winchester included Guildford, until Guildford broke away to form its own diocese in the inter-war years (1927). Construction of Guildford Cathedral began in 1936, only one of two new Anglican cathedrals since the Reformation, the war held up the work and the consecration of Guildford did not take place until 1961. Guildford Cathedral sits on top of Stag Hill. Cathedrals in England are some of the country's finest example of architecture, Guildford Cathedral is the notable exception. The gold angel on top of the cathedral is unsightly, looking more like a fairy on top of a Christmas tree. The spacious interior is a pleasant contrast to the exterior. The foundation stone of Guildford Cathedral, brought down from Jarrow, rests on top of stones from the fabric of Winchester and Canterbury Cathedrals, thus linking the Dioceses of Guildford, Winchester and Canterbury with the home of the Venerable Bede (who died at Jarrow). On the side of Stag Hill, below the cathedral, lies the campus of Surrey University. Although established in the late-1960s at the same time as several other new universities, Surrey University was somewhat different in that it had its origins in an engineering college of some repute in Battersea. In the mid-1970s Surrey University was a green and pleasant site, during term-time a heightened buzz. Now there is barely a blade of grass to be seen, during term-time impossible to move, too many students far too few facilities - a greater affinity with an industrial park than the gleaming spires of academia. Many Chinese students now study at Surrey - so many that many of the notices on site are bilingual, Chinese and English. Guildford is a very good regional shopping centre. Particularly notable are the number of excellent bookshops and several specialist shops. In recent years, many good shops have closed, the two oldest bookshops have closed, as has a long established outdoor shop and breadshop. Guildford had two net cafes - Quarks (Jeffries Passage, top of the High Street) rather small and cramped, too often resembles a large ash tray, and Cafe Net (Phoenix Court, lower end of town) a more the traditional cafe with a wide selection of food and a large number of machines, the in-house expertise is excellent. Now only Quarks remains, Net cafe is a good place for a afternoon tea and cakes. In the spring Guildford hosts the biennial Guildford International Music Festival. One of the star attractions in 2003 was Zum, an eclectic fusion of Eastern European gypsy music and tango. Not to be confused with the Guildford Spring Music Festival, also held in the spring, which in 2010 celebrated its 4th anniversary. Like its big brother, gsmf is also a biennial event. The railway line from Guildford to Redhill (route to Gatwick Airport) provides marvellous views of the Surrey countryside. It is possible to alight at several of the small stations from where it is possible to walk in the Surrey Hills. The Surrey Hills were designated as an Area of Outstanding Natural Beauty (AONB) in 1958. Traditionally sheep country as the hillsides are too steep and the soil too thin and poor to support agriculture. Pour in sufficient subsidies and anything becomes possible, aided and abetted by agrochemicals and horsepower. Looking at the steep hillsides where the plough has been active it is easy to see why it was traditionally grassland. The soil is so thin that it has worn away and the chalky subsoil can be seen showing through. No longer sheep country, many of the uncultivated hillsides are starting to revert back to scrub and woodland. Where the grass is still grazed, it is comfortably springy underfoot and a delight to walk upon. North of Guildford, a little way downstream, almost encircled by the River Wey is the Tudor Sutton Place. Built in 1530 by Sir Richard Weston, a favourite of Henry VIII. Sir Richard Weston served on the jury that condemned Buckingham and was given Sutton Place on the day of Buckingham's execution in the Tower. Sir Richard's son, Francis Sutton was a lover of Anne Boleyn and lost his head over the affair. A couple of generations later, during the time of Charles I and Oliver Cromwell another Sir Richard Weston was responsible for turning the Wey into a navigable waterway. Sir Richard Weston was also an agricultural reformer and introduced a new three crop rotation of clover, flax and turnips, he also introduced into Surrey the grass Nonsuch. Within Sutton Place is the blood stained ruff of St Thomas More and a crystal pomegranate that once belonged to Catherine of Aragon. Almost opposite, across the river from Sutton Place lies Send Church. The church has a 13th century chancel, 15th century tower and nave and a Tudor gallery. To the east of Guildford, at West Clandon, Clandon House, seat of the Onslow family. The present Palladian-style house (c 1730) was built for Lord Onslow. At nearby East Clandon, the Georgian Hatchlands Park (c 1750), built for Admiral Boscawen (who defeated the French at Lagos Bay, 18th Cent). The interior was designed by Robert Adam on his return from Italy and Dalmatia. Within, the Cobbe Collection, a fine collection of musical instruments. North-east of Guildford lies the Royal Horticultural Society Gardens of Wisley. Beyond Wisley, in the village of Cobham, the grounds of Painshill Park (18th Cent) are being carefully restored to their former glory. Mathew Arnold lived at Pains Hill Cottage. The North Downs Way, running west to its start at Farnham passes several interesting places. A little way south of the North Downs Way en-route to Farnham lies the Elizabethan Loseley Hall. Built with stone from the ruins of Waverley Abbey. Apart from the house, Loseley is also known for its dairy products - the yoghurt is overpriced and overrated. Compton has the finest Norman church in Surrey, if not England. Within the church are two Anchorite cells. Also at Compton is the gallery of G F Watts, a long forgotten Victorian painter. It was here that Cecil Rhodes took tea before setting out to carve out Rhodesia. Puttenham Common is a vast expanse of unspoilt heathland. The Iron Age hill fort of Hillbury gives extensive views of the surrounding countryside. On the southern edge of Puttenham Common are the Cuttmill Ponds. Within Puttenham are several fine old barns. The church retains some Norman features. Remnants of ancient woodland lie to the north of the Hog's Back. Also to the north of the Hog's Back, the hamlet of Wanborough. The 13th century church is the smallest in Surrey. Adjoining the church, Wanborough Manor (1527). The village also posses a Medieval barn. 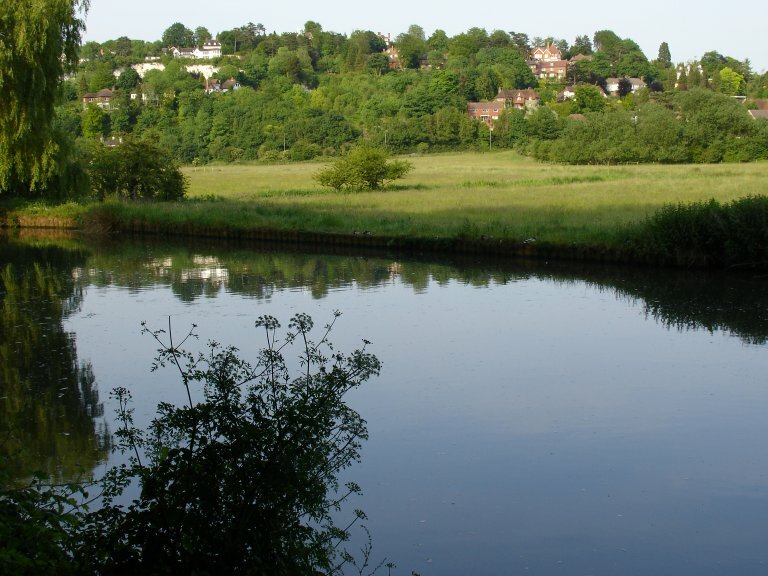 The Hog's Back, is where the North Downs narrows to a narrow ridge running from Farnham to Guildford. Extensive views of the surrounding countryside from both sides of the Hog's Back. East of Guildford at Gomshall the recently restored Gomshall Mill (11th century) on the Tillingbourne. The Domesday Book recorded a mill on this site. 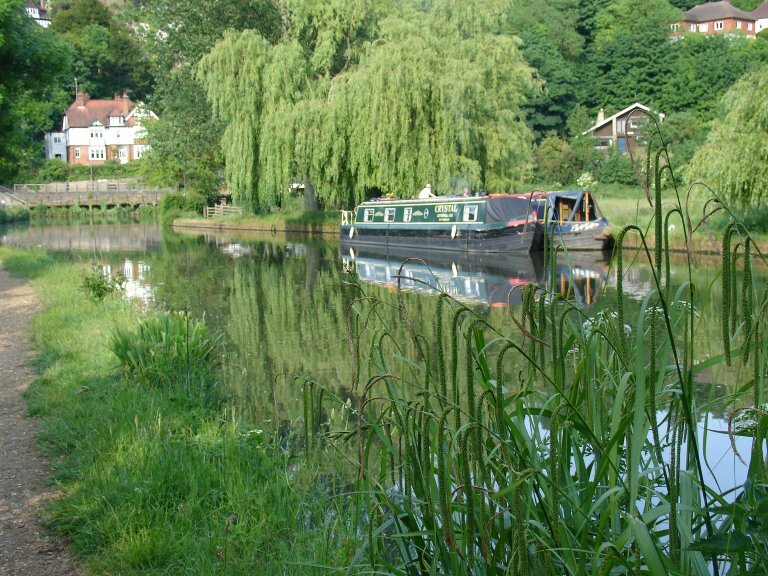 Nearby is the attractive village of Abinger Hammer. Hammer is derived from the many hammer ponds that used to be in this area. At one time this part of Surrey was extensive iron workings. South of Guildford, a little way upstream, lies Shalford. 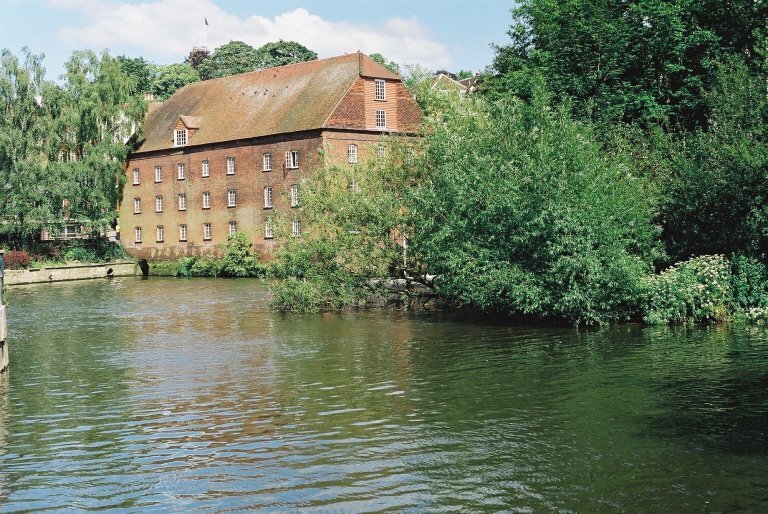 Shalford Mill is powered by the Tillingbourne stream. King John granted the rector of Shalford Church the right to hold a fair. Originally held in the churchyard, the fair grew in fame and size and had to be moved to Shalford Common where it was reputed to occupy 140 acres. John Bunyan, author Pilgrim's Progress , may have lived in Shalford and obtained the idea for Vanity Fair from Shalford Fair. It was at Shalford Quay that the Wey & Arun Canal entered the Wey. 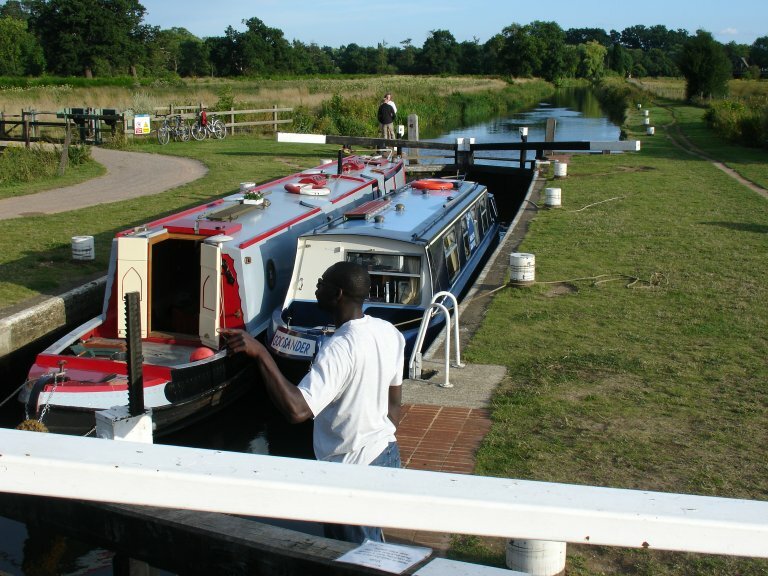 The Wey & Arun Canal completed the last link and established a navigable waterway from London to the South Coast. Shalford Park has recently in mid-summer become the site of the Ambient Green Picnic. An excellent day out, good food, pleasant music and lots of interesting stalls. The day is free, but free festivals don't come cheap, please give generously when asked for a donation. The picnic for 2000 was cancelled. In previous years the Guildford Philharmonic had played the night before (leaving mountains of rubbish) and the costs have been shared. In 2000 the Philharmonic refused to cooperate and the local Council refused to cover the costs. Although restarted in 2001, the Ambient Picnic never quite recovered its momentum and no event has been as good as the 1999 picnic. In 2005, it was decided to levy a charge of £5 for what had hitherto been a free event. For 2006, there will be no Green Picnic whilst the entire concept is rethought. After an absence of a few years, the Ambient Green Picnic was back in Guildford, only it is no longer called ambient or even green, is a shadow if not a parody of its former incarnation and what was once a free festival now costs a tenner to get in. Two small towns worth visiting are Godalming (immediately south along the River Wey) and Farnham (to the west, at the end of the Hog's Back). 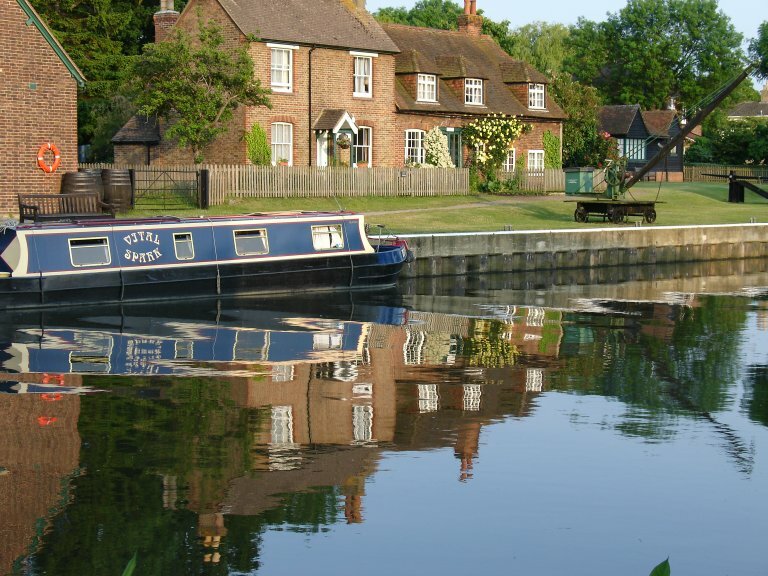 Both towns can be reached on foot - Godalming along the banks of the River Wey, Farnham along the North Downs Way. Milford, south of Godalming, holds a highly successful Farmers Market at Secretts Farm. The prices are not cheap, the emphasis being on quality local produce. Secretts Farm is one of the few remaining horticulturalists left in the Thames Valley. Once there were a couple of hundred. All have been driven out of business by the cut-throat business practices of the large supermarket chains. Secretts Farm has a farm shop that is well worth visiting. Guildford Station is on the main line from London Waterloo to Portsmouth. A line also runs from Reading (South West, Wales, Midlands), through Guildford, to Gatwick Airport. The short walk from the station to the town is extremely unpleasant due to the density of road traffic. An alternative and much preferable route into town is to follow the sign post for the cinema and law courts, cross the road, and instead of crossing over the river on the footbridge, descend down the steps to the river bank, walk upstream to the Town Bridge, cross the bridge and you are at the bottom of the High Street. Since the erection of barriers on all the exits to the station and their manning by a large number of surly individuals, the traveller, on arrival at Guildford Station, could be forgiven for believing he is in Eastern Europe under the Communist era and the station is being manned by the Stasi. It is not uncommon to see five on the town centre barrier, two on the exit for the car park, and a couple more on the exit for the university and top end of the town, plus a couple of police to deal with irate passengers and the inevitable disputes that arise. It is a struggle to negotiate the barriers when carrying baggage or accompanied by small children, and too much trouble for the staff to open the gate. The role of those manning the barriers seems to be to treat the travelling public as common criminals. There has been cases of intimidation and at least one member of the public has been assaulted. The money spent on the barriers and personnel would be better deployed on providing improved services for the travelling public. Ironically, at night, when hoards of drunken yobs are rampaging through the station (very bad on Friday nights), there is not a single railway person in sight. Guildford is twinned with the German town of Freiburg. The Angel Inn has published an excellent series illustrating the history of the inn. Guildford Council and Thames trains have published a leaflet illustrating a few walks in the Surrey Hills. Guildford Museum has several exhibits illustrating the development of the town. Guildford Borough Council maintains its own Web site. During the summer months there are a series of guided walks through the town. Synchronicity: Talking to a lady and her children looking at the Castle, I showed her where to find Alice. I also gave her the address of this web page. Why Klara, is my name, her and her children exclaimed!